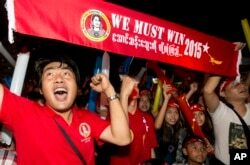 Supporters of Myanmar's National League for Democracy party celebrate as election results are posted outside the NLD headquarters in Yangon, Myanmar, Nov. 9, 2015. Myanmar opposition leader Aung San Suu Kyi's political party has won the first seats in what is expected to be a landslide victory in Sunday's parliamentary elections. Election officials announced Monday that the National League for Democracy had won 12 lower house seats in the main city of Yangon. The NLD later claimed to have taken 44 of 45 lower house seats in Yangon, although that figure wasn't immediately confirmed by election officials. Earlier Monday, Aung San Suu Kyi expressed confidence her party would win the historic vote in a speech to supporters outside NLD headquarters in Yangon, but she did not claim outright victory with the votes still being counted. Aung San Suu Kyi also urged her followers not to provoke the candidates who did not win. 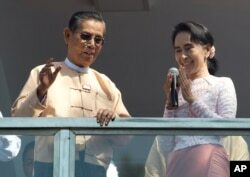 Leader of Myanmar's National League for Democracy party, Aung San Suu Kyi, delivers a speech with party patron Tin Oo from a balcony of her party's headquarters in Yangon, Myanmar, Nov. 9, 2015. NLD spokesman Win Htein told reporters the party has won 70 percent of the vote nationwide, based on unofficial tallies. Htay Oo, the chairman of the ruling military-backed Union Solitary Development Party, said on Democratic Voice of Burma TV that he lost his own seat in the election, and admitted that the ruling party had "lost more seats than (it) has won." Another losing USDP lawmaker was parliamentary speaker Shwe Mann, who was considered a candidate for president. In Washington, White House press secretary Josh Earnest congratulated the people of Myanmar following the election and said it is important for all political leaders in the country to work together to form a new government. "Ultimately responsibilities of [opposition leader] Aung San Suu Kyi will be up to the people," Earnest said. He added that it is too early to tell whether U.S policy toward Myanmar will change as a result of the vote. The first results were scheduled to be announced Monday morning, but election officials delayed the announcement until later in the day, without giving a reason. The Myanmar Times says the NLD has issued a formal complaint to the Union Election Commission over a change in election procedures. The party says the UEC has instructed local election officials to send election results directly to the commission's offices in the capital Naypyitaw, instead of sending them first to local and state election authorities. 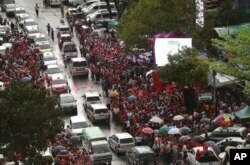 Supporters of Myanmar's National League for Democracy party, gather outside the NLD headquarters in the rain in Yangon, Myanmar, Nov. 9, 2015. UEC Chairman U Tin Aye told reporters that there have been 48 recorded instances of voting irregularities around the country. He denied allegations that the commission is improperly controlling the election. Election officials have been counting as many as 32 million votes cast in Sunday's elections. "Our view is that it was obviously a peaceful election," Phil Robertson, the deputy Asia director of Human Rights Watch, told VOA in Yangon. "The people of Burma had the opportunity to finally, after 25 years, to finally say and express their views as to who should govern them." But Robertson said "the larger question is going to be whether these results that come out of the election are fair," expressing particular concern about allegations of bias within the UEC. “Clearly there were defects, not everything was perfect,” International Republican Institute president Mark Green told VOA in an interview in Yangon. “The Burmese people are right to look carefully” at the official results when they are issued. “The judgment of the election is up to the Burmese people,” said Green, a former U.S. ambassador to Tanzania. “We have to see this election within a framework which is not openly democratic in the full sense,” remarked Ireland’s former president, Mary Robinson, who was observing with the Carter Center. Millions of people, including Rohingya Muslims in Rakhine state, are disenfranchised for a lack of citizenship and other reasons. Samantha Power, the U.S. ambassador to the United Nations, called the disenfranchisement of the Rohingya as among the many "significant flaws and challenges that must be addressed going forward" in a statement Sunday. Earlier, U.S. Secretary of State John Kerry congratulated the people of the nation, also known as Burma, calling the election "a testament to the courage and sacrifice shown by the people of Burma over many decades." He said the elections were "an important step forward," despite being "far from perfect." This is Myanmar’s first election since the military junta established a nominally civilian government in 2011 after nearly 50 years in power, and a year after Aung San Suu Kyi was freed from house arrest and a ban lifted on her party. The Nobel Peace laureate and her party scored a resounding victory in 1990 but were prevented from taking power. The ruling party contests the election with one decided advantage: 25 percent of the seats in parliament are reserved for military officers. Supporters of Myanmar's National League for Democracy party brave rain outside the NLD headquarters in Yangon, Myanmar, Nov. 9, 2015. Amnesty International said the jailing of peaceful activists, restrictions on free speech and other discrimination against minority groups are a serious problem undermining the electoral process in Myanmar, also known as Burma. 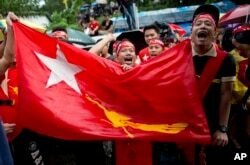 Myanmar political experts say the NLD needs to capture 67 percent of the parliamentary seats in Sunday’s election to overcome the military’s veto in the bicameral legislature, known as the Pyidaungsu Hluttaw, which selects the president. Aung San Suu Kyi is prevented from becoming president even if her party is victorious. The military junta governing in 2008 placed a clause in the constitution barring anyone with a foreign spouse or children from holding the highest office. Aung San Suu Kyi’s late husband was British, as are her two children. Nearly 7,000 candidates from 91 parties sought posts in both houses of parliament. Myanmar, a former British colony, was isolated from most of the world for decades after General Ne Win in 1962 staged a coup, abolishing the Buddhist-majority country’s constitution and its democratic government.